Thumbnails are now being generated automatically for more than 100 different file types! Video, PDF, Photoshop, InDesign and many many more file types will now show a thumbnail of the file content, instead of the icons used before. Remember you can always override the thumbnail for a file if needed. Just navigate to the file and click the thumbnail in the top left corner to set a new thumbnail. Better destinction between Core and User Attributes. The interface for importing has gotten a big makeover and is much more user friendly now. To avoid import errors before they happen, a new step of confirming the data is being displayed correctly before mathcing columns has been introduced (confirm charset settings). The Files-section of your PIM has received a big makeover in order for you to work even more efficiently. Now you can sort by the columns in the table, filter out specific files based on file type, size etc. and also execute bulk actions across multiple files. Furthermore, a grid view has been implemented so you can get a better overview of your files with larger thumbnails. A new support chat has been implemented for you to have an even better experience when you need a little help from us. The new chat can both connect you directly to a Plytix agent for a live chat, and also help you submit service tickets such as feature suggestions or if you happen to find a bug in the system. 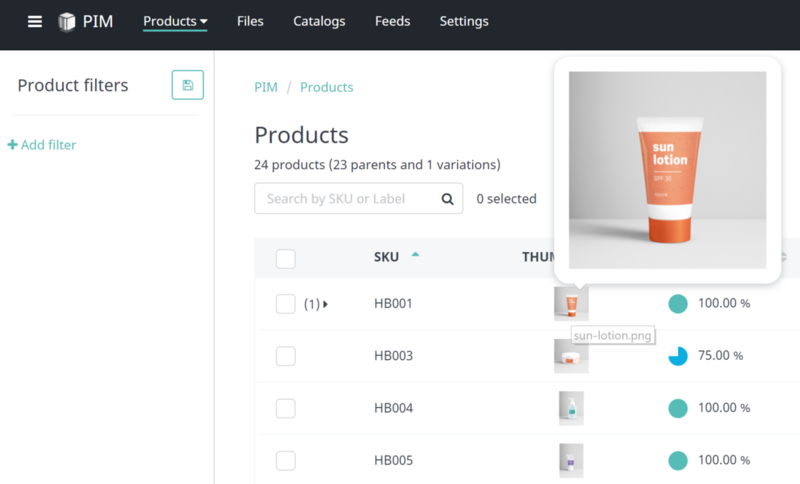 You can now edit your product attributes directly from the All Products-screen! If you hover your cursor over the headers, you can click the edit icon, this enables you to work your way down the rows in spreadsheet-style and manipulate an attribute across multiple products very quickly. We are very happy to report that the API for the PIM has been published! You can swing over to https://apidocs.plytix.com/ to take a closer look at the functionalities. The entire Plytix application has also been migrated to the API, in order to "take our own medicine" before releasing it to the public. In short, an API allows for other software platforms to talk directly with Plytix. Ie. you can get your ERP-system to automatically create new products in Plytix and flag them for content enrichment, hereby eliminating the manual task of uploading new products to the PIM, neat! After processing all your valuable feedback, we're happy to present the new product editing screen! Product information is being put at the center and a palette of new functionalities will significantly enhance the experience of working with your product information. Surely Plytix will start publishing changelogs very soon.